Right, so you decide to build a boat yourself. You have planned and taken the first steps, consulted with people of experience and perhaps even bought some of the things you’ll need. The most important part, actually, is finding a space to build the boat. This importance is compiled of several aspects. Our building space. Click for a larger image. Firstly, the more space you have for moving around, the better. Plywood, the bulk wood and what not takes space. It takes space to operate with the wood, lift it around, inspect sheets. Laying a plywood sheet flat and cutting it. 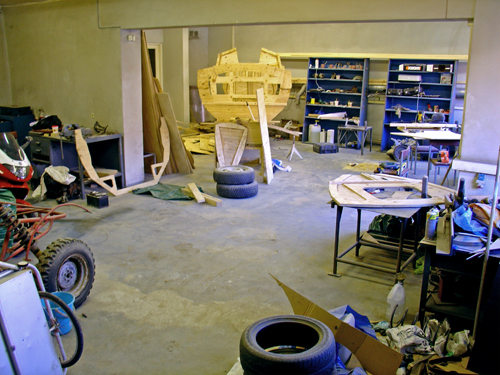 You could build Fafnir in a garage, this is also what we planned on doing – a space where the boat would barely fit – , but it would add a whole lot of time and frustration to your work. Temperature. If you use epoxy, you need at least 18-32 degrees Celsius (64-70F) for the epoxy to dry properly. There are special mixes that dry in cold as well, but these are harder to come by, and they are probably more expensive. Breating in toxic fumes ain’t a past time we like. So, ventilation is good to have as well. Epoxy fumes are very toxic, don’t breath it! When you get to sanding, all of your garage will be covered in a layer of fine wood dust. Not a very good thing to breathe in either. Electricity is a must in all aspects. It might seem strange to even mention this, but for example not all rentable garages are equipped with wall outlets. Usually it adds to the rent price if there is electricity. We build in an old welding lab, so we have very good forced ventilation in the garage. We also have a lot of space. Fafnir is 4 meters long, we could build a 8 meter boat if we wanted to, but it would be a bit difficult to get it out later. Which is another aspect to concider. Building a fine sailboat and not being able to take it out to water, because it does not fit trough the door would definitely get you a Darwin award. It was not easy for us to find this space. We asked from here and there, and in our last hopes we were mentally prepared to build the boat in a under 4 meter lenght garage. Then we asked around some more and we stubled across the old welding lab, which is now used by University of Life Sciences technics club. Thanks to Marten Madissoo for granting acess! If you can’t find a good space, look more. It is out there. Hi There Estonian Boat Builders! Well, I wish you the best luck with the rest of your building, and eagerly waiting for new updates! Glad to read that you like the site! We try to put some more into it than only blogging the build. The Estonian section has knotmaking videos as well, for example. Well, about the books. What really defines the book you want depends on which boat you choose to build. If you want to design your own boat, then I’d probably advise you to use some sort of software, to get the buoyancy and all that correct. But since you are a mathematician then calculating the dynamics yourself ought not to be a problem. One of the great books of boatbuilding is “The Gougeon Brothers On Boat Construction, Wood & West System Materials”. This book is written by the Gougeon brothers that were pioneers in epoxy laminated wood hull boat building. They even worked with NASA when designing wind turbine blades. A lot of the times the books you get are written by someone that builds boats (oh really? – you might ask), but therein most often lies a definition of what the book will be like – tips and advice that an individual has invented or learned from someone. In the long run you can collect a whole ton of these tips, but they all mean nothing until you have actually started building. Meanwhile they are good past-time reading. The Brothers book is good because it shows how materials act and combine with scientific methodology. Of course, the book also has a ton of tool using tips and so on. But I find it’s main value being in the theoretical side. Handling a jigsaw for cutting out Fafnir bulkheads is not really a big deal. Material dynamics – now that is where it gets tricky. Okay, but the best advice actually comes from meeting real people. That is what we did when we started building. We asked around;”Hoi, you know anyone that has built a boat?” By asking people we knew, we eventually ended up getting advice from world champion race boat builders (believe that). And, all this will solidify once you have chosen a design to build. It is the foundation. Meanwhile I suggest you check out Yrvind’s page and Sebastian Näslunds Arrandir from our “Inspiration” section, those are some wild guys, especially Yrvind. We are building our steaming rig for the time being, next week starting on the stringer layout. Which would you recommend if someone were in fact to design a boat? Congrats on your (great great) site! Well, the book which I have heard mentioned the most is “Gougeon Brothers on Boat Construction: Wood and West System Materials”, Amazon sells it here: http://www.amazon.com/Gougeon-Brothers-Boat-Construction-Materials/dp/1878207504. It is a fine book and I as a physicist like it due to its methodical approach to describing materials and how they are combined. Sure, it is written by “West System” founders and according products are used, but.. well… they know how to sell their stuff. As for designing a boat, maybe Joosep can add some detail, as he has looked into the math of it, which is not at all trivial. Of course there are general guidelines which will produce a sturdy boat, but perhaps not the kind that will be the “F1 car” of boats.